I've said it before: Uncalendar is the best system for setting and achieving goals I've ever seen. The book helps you think about and organize your goals, break them into do-able tasks, and get them down on paper. Then, the crucial thing happens: it helps you figure out how to work your goal-tasks into your daily and weekly schedules. There's even plenty of space to record your progress, which is crucial for achieving your goals. 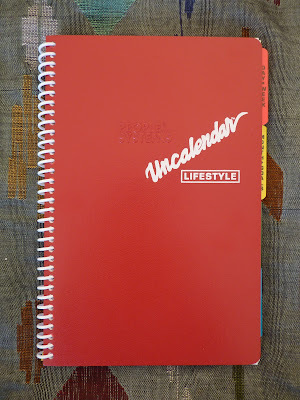 I've reviewed the Full-Size Uncalendar Lifestyle (click here to see review) but I think the Half-Size Uncalendar layout is different enough to merit its own review. 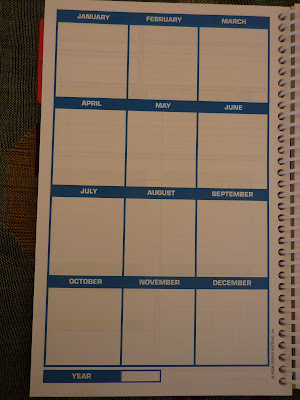 The Full-Size Uncalendar has 8 1/2 x 11 inch pages, and the Half-Size pages are half that size for greater portability. The 8 1/2 by 5 1/2 inch book is perfect for carrying in your bag or backpack while still having lots of space to write on the pages. 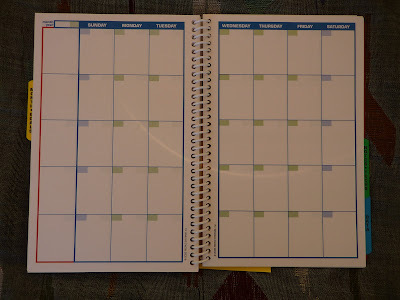 Uncalendar planners have undated weekly and monthly pages so you can start anytime. This is great for people whose "year" starts in June or October or some weird time. It allows you to start your planner at the beginning of a project and use the planner for the duration of that project to have the entire timeline all together. Something I've never done but thought of is starting a new Uncalendar on my birthday and having that entire year together in one book. 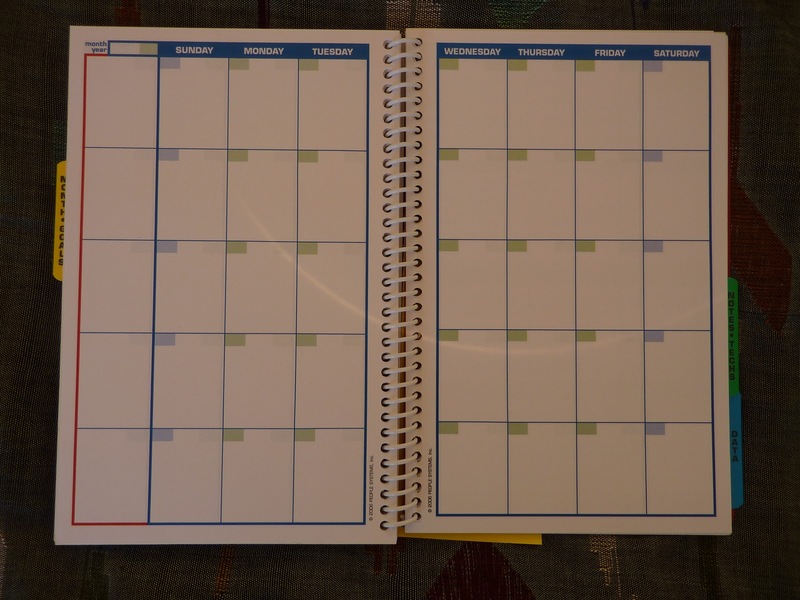 Also since the pages are undated, you can use the planner only when you need it so you don't waste pages when you are on vacation. 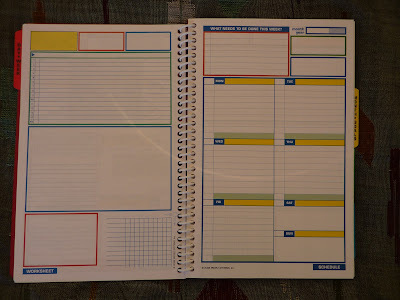 Also along the side of the book you can see the tabbed sections are: Day-Week, Month-Goals, Notes-Techs, and Data. In addition to the pages I've shown below of the layouts, there are several pages of tips and advice on how to adapt and use the pages to suit your needs best; setting goals; managing tasks; motivating yourself; and daily reminders to help you in the categories of Diet and Exercise, Family and Friends, and Career and Work. The tone of the book is very motivational and friendly. The Day-Week section has the weekly planning spreads. Below is the weekly layout, which is different from the Full size layout (where the weekdays are columns and the weekend days below, click here to see image). You can click on any of the photos below to see a larger view. 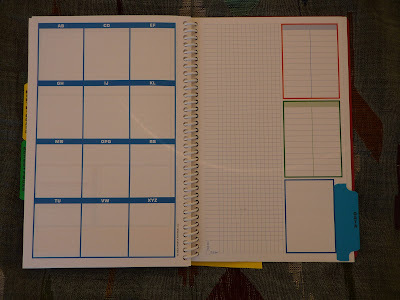 The right page has the weekly schedule with day spaces, and at the top of the page is space to write the main goals for the week. Each day's space has a highlighted line at the top to note the major event of the day, and a green line at the bottom for daily totals (expenses, exercise, etc. ), meal planning, or anything else you want to highlight for the day. There is a box at the beginning of each line to note appointment times or to check off items completed. 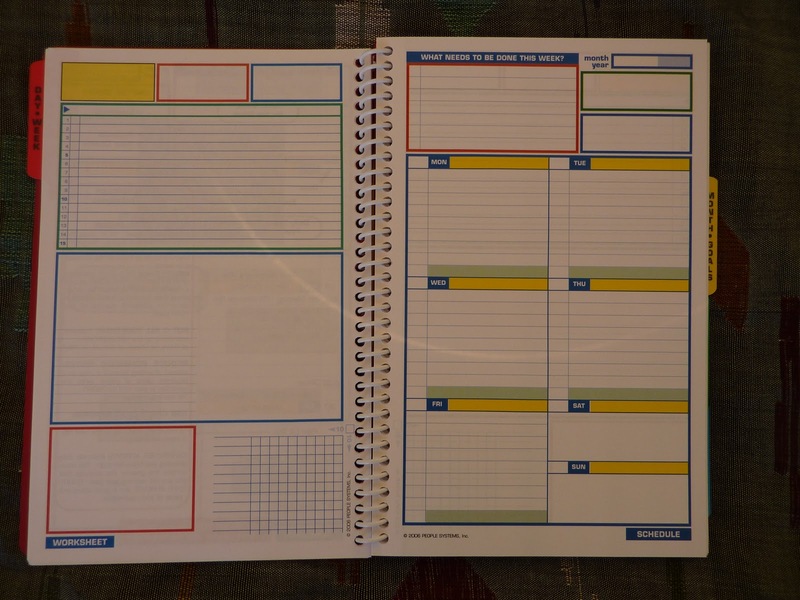 The left page is the Worksheet with plenty of space to list tasks, break projects down into next steps, jot phone numbers or notes, or doodle. There is a grid to track goals progress or financial details. At the top of the page are highlighted boxes for your Daily Reminders or other important things to keep in mind. These pages make great reference later when you need to look up your notes or records. The Month-Goals section has goal-setting pages and monthly calendars. Below are the Goals-Setting and Monthly Planning pages to guide you in setting your larger Lifestyle goals and then breaking them into do-able tasks. (There is more information on how to do this written in the Uncalendar pages). Also you can check out the Uncalendar's Training Room website for more advice on how to use the pages to set your goals. Below you can see the layout of the monthly calendars. 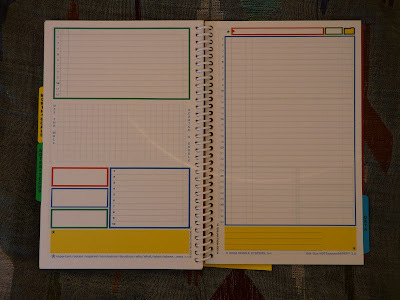 The undated monthly pages spread the month over two pages for maximum writing space in the day squares. Also there is an empty space at the beginning of each week for notes, reminders, goals, totals or anything you want to write. Side note: I prefer to have my monthly calendars go Monday-Sunday rather than Sunday-Saturday, so I mark out the days written and write Monday-Sunday in the space above. On the left page you can see there's space for frequently used numbers and other data for handy reference. The Notes-Techs section has twelve of these two-page spreads for notes, graphs and reminders. 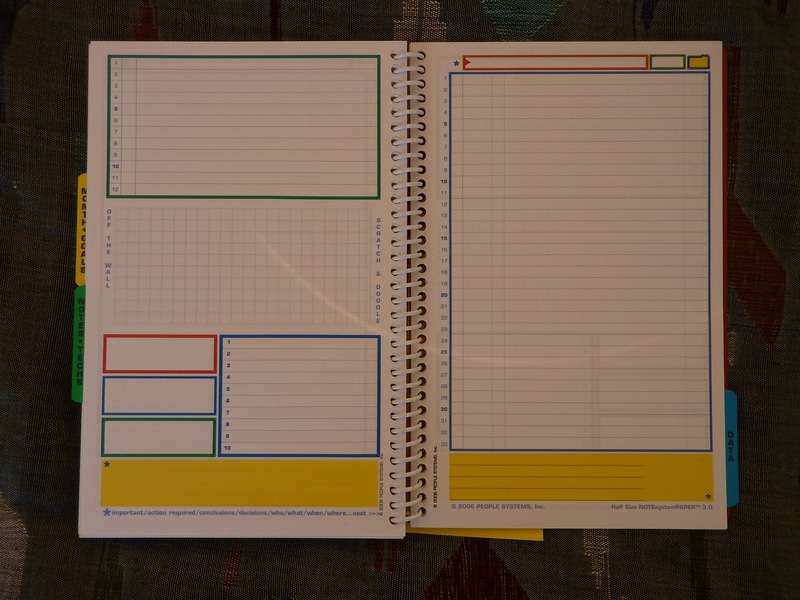 (The Uncalendar Lifestyle Pro planners in the 3 ring binders have twice as many Notes pages, and A-Z tabs for contacts.) I like to use a two-page spread each month for my monthly goals and monthly reviews. Click on the photo to see a larger view so you can see the columns for blocking notes, numbered lines, and graph for charts. This structure is great for organizing notes. The Data section has a quick-reference A-Z page, graphs and charts for reference. The book holds an entire year of plans, goals and notes within its flexible covers, yet still manages to be only 1/2 inch thick and very light! 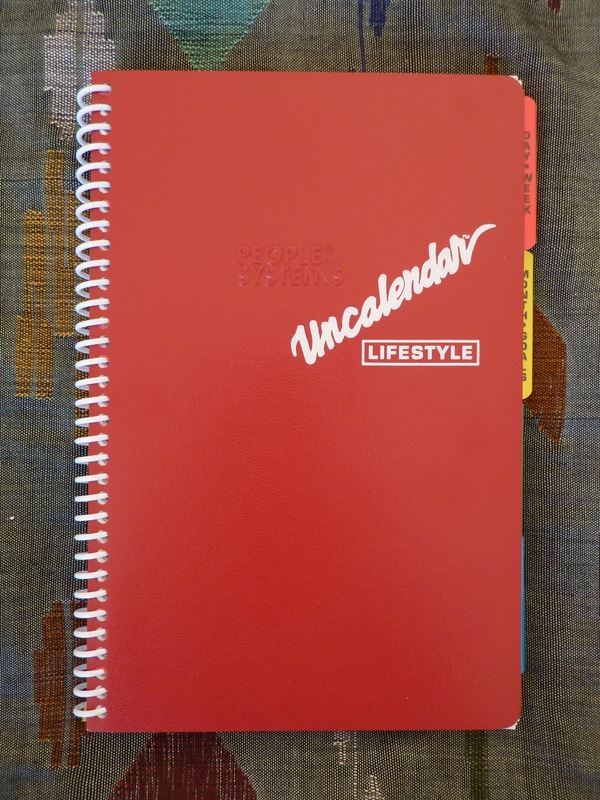 You can purchase the Half-Size Uncalendar Lifestyle (with a variety of cover colors) at the Uncalendar website (click here to go directly to the product page). You can see the entire line of Uncalendar products at www.uncalendar.com. Don't miss their Customer Comments, they are very inspiring! 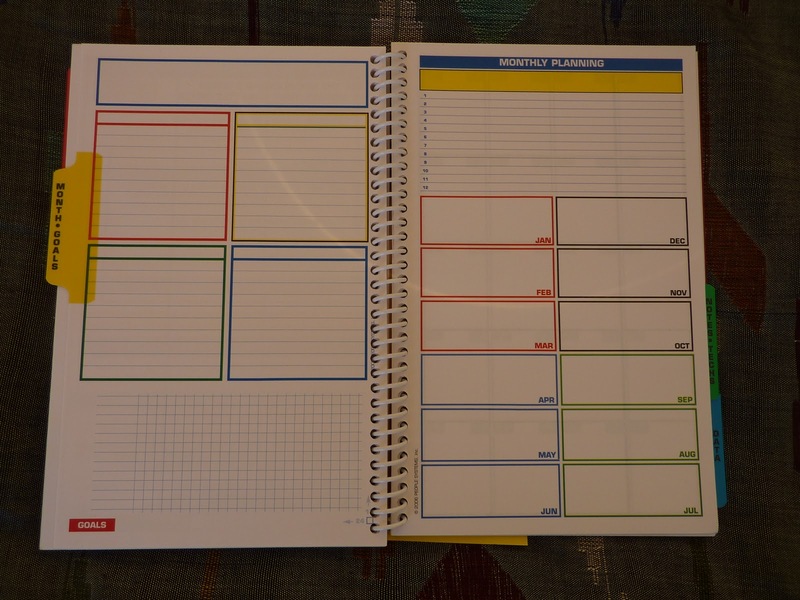 You can see my post about how I use this Half-Size Uncalendar here at Time For New Goals! 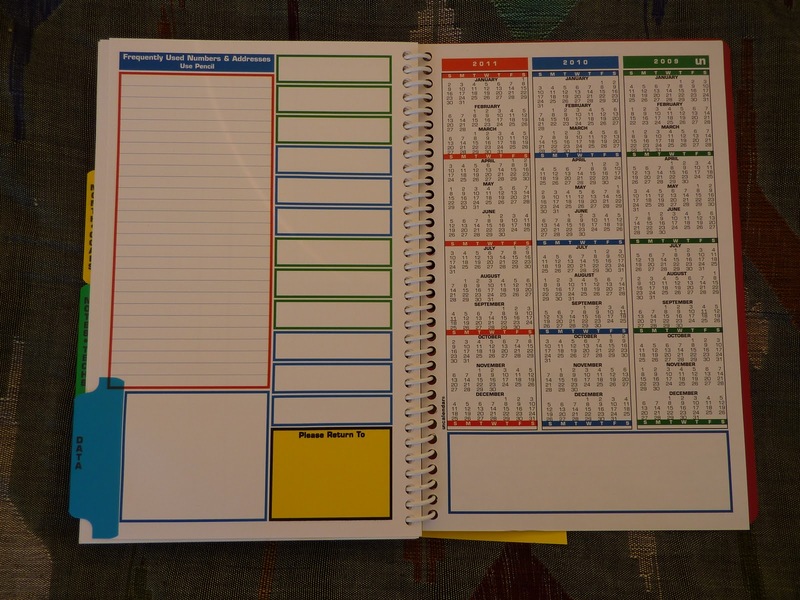 If you find this system interesting but need more space to write, check out my review of the Full-Size Uncalendar here. 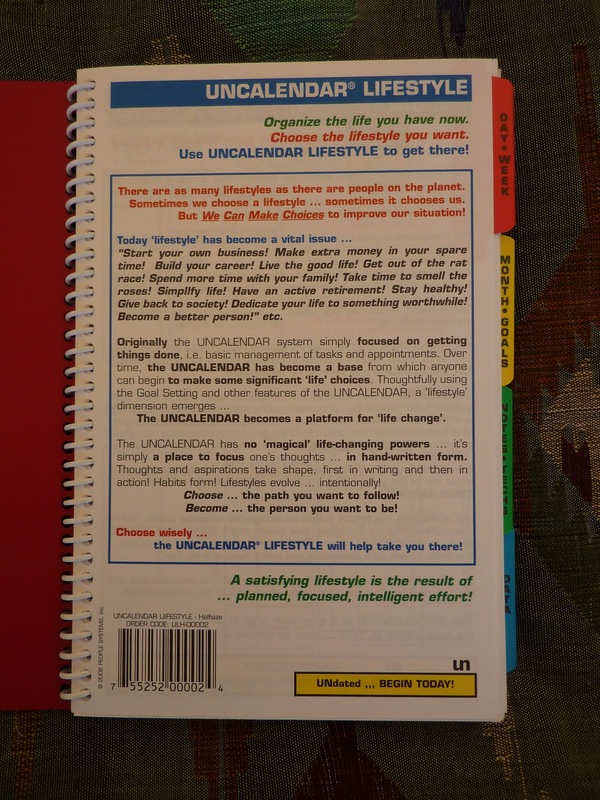 To read about how the Uncalendar system can help you set and achieve your goals, read my post Secrets of Success. And whether you are interested in the Uncalendar or not, be sure to look through The Training Room. It's completely free, and has loads of tips for goal setting, managing people, projects and finances, and other generally motivating advice. I like to go there every now and then to recharge. Got goals? 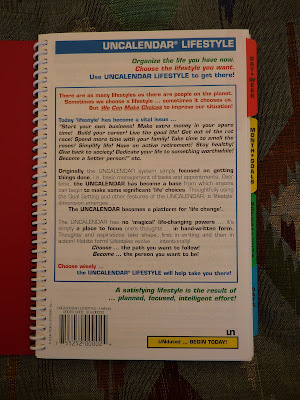 Get an Uncalendar! I like this format a lot, with all the colour-coding. I wonder though if it takes some getting used to deciding which box to use for what. It seems like the opposite to a bare-bones Moleskine. Are the printed areas difficult to write on with a fineliner (i.e. are they glossy)? Christine, the printed areas are not at all glossy and would take a fineliner well. The paper is nice and thick with no show-through to the other side, which is great for those of us who tend to fill the pages with writing! And yes, it takes some thinking to decide how best to use the boxes and what to write where. It's nice to have some structure but nobody dictating what you have to write where. And of course you can use it differently every week if you want. OH. MY. Gosh! You must have totally been reading my mind! I've been thinking about the Uncalendar this past week and reading over your review of the large size, then someone had a link in the comments of their review, then reading the website itself...LOL. Addicted? Slightly..LOL. Since my disappointment with the Rabbit, I've been searching for something else. The only thing that draws me away from this is the smaller (UNLINED!) weekend boxes. With 4 children, my weekends are just as busy as my weekdays. I would use this as my daily planner. I don't have definite goals, mainly to just get through with everyday life! And I'd have to find some way to prettify this..LOL. Maybe I'll put this on my Christmas Wishlist! emelyn, I wonder if the day spaces in the Half Size would be large enough for you since the Rabbit's day spaces were too small. The weekday's spaces in the Half Size measure 2 inches long by 2 1/4 wide. You might consider the Full Size if you don't mind the large size book, it has plenty of room each day (even on the weekends) and a full size page for notes and lists each day. You'd be able to rule the universe with the Full size! I meant a full-size page for notes and lists each WEEK, not day. The Full Size has loads of space to write and would be excellent to manage your life and keep track of everyone in your family. The colors and grids were what drew me to this initially, but I soon found that it's just too busy. Yellow and red cease to draw my attention when they're there all the time. It's better for me to have something less colorful, and then when I highlight things myself, they actually stand out. I do like the layout, though, and it didn't take me long to naturally start using different boxes for certain things. I found the day boxes to be a bit too small, though. 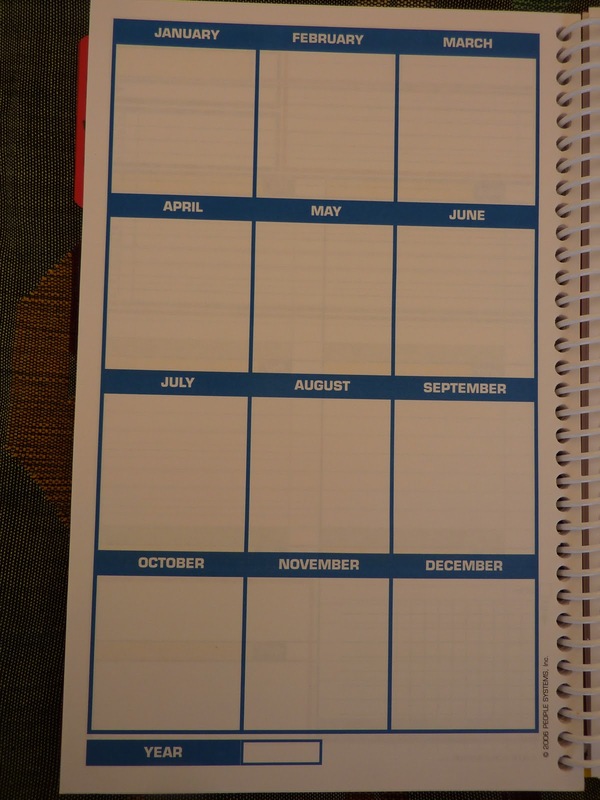 Do you think the half-size uncalendar would fit into one of the Rick Shaw moleskine folios? Becky, they DON'T unfortunately, and I have tried. 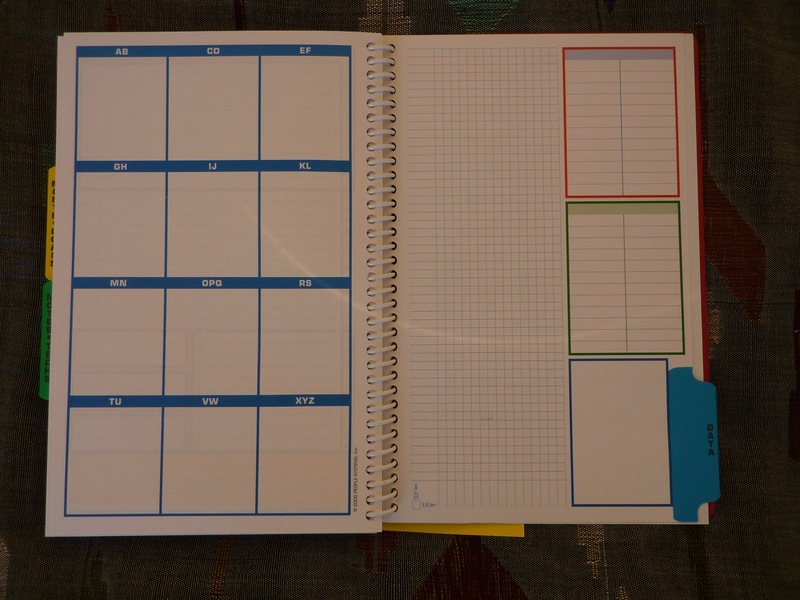 Interestingly, I just discovered the looseleaf version of the Uncalendar planner is available unpunched, so you can punch the holes to fit any binder you like. The Half Size pages are 5 1/2 by 8 1/2, which are the same size as the Franklin Covey Classic size pages so they would fit into one of those binders after punching.